I'm sure I am not the only one who is interested in scars and whenever I hear of someone who has had an operation I always wonder how the procedure "made their mark". On that note I thought I would share my surgical and da Vinci robot scars with you (7 in total) in case you are just as curious as me. 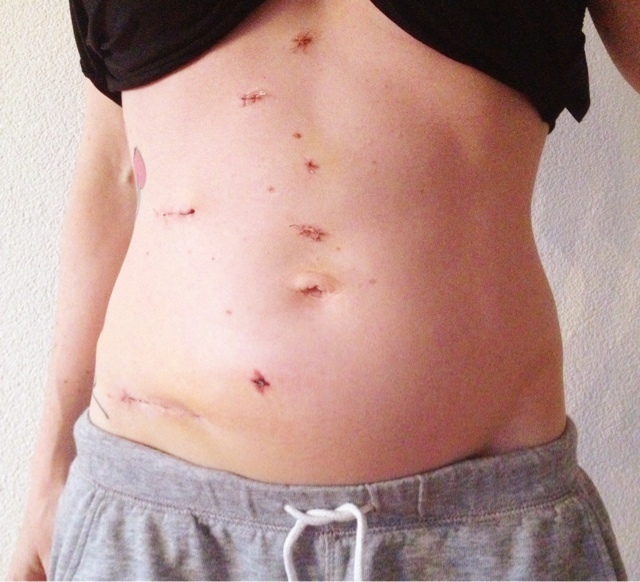 Even though I told my Surgeon that I didn't care about what kind of scars I would have (whatever worked for him the best to get Lionel outta there) he kept the incisions to the bare minimum and it surprises me just how he managed to get a big guy, like Lionel, my kidney, a few lymph nodes and blood vessels out of that small surgical incision. So, there you have it. They actually look more like bullet holes and a couple of stab wounds - I could come up with a good story for that, but I prefer the real story of how an extremely talented (and thoughtful) Surgeon saved my life with his robot. Hahaha! 3 cheers for not being dead!!! Too funny! Pretty cool scars! You look like you've survived a drive-by! Lol.